KSplashX, a potential replacement for the KSplashML engine is imported into KDE SVN. Continued progress in the Solid and NetworkManager integration. More refinement, including better keyboard shortcuts, in Konsole. New keyboard layouts in KTouch. Icon and undo support in Step, the educational physics simulation package. KBounce becomes the latest game to move to a scalable interface and graphics. More work in KSquares, Konquest, KSpaceDuel and KReversi. 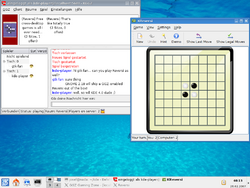 KSudoku starts to be ported to KDE 4. Initial support for input fields and other form elements in okular. A co-ordinate grid and Wikipedia entries for cities comes to Marble. Further improvements, including the addition of Tree View functionality to the Dolphin file manager. New features in Mailody. Initial video support in Amarok, with heavy interface redevelopment underway for version 2.0. Last stages of an interface overhaul for the next version of KTorrent are completed. Proxy support added to the KDE Windows installation utility. Strigi is moved from playground to the kdesupport module. There's branches/work/ksplashx in SVN. It's based on the ksplashx SUSE has been using since like 9.3 (I don't really remember). There's a README, but in short, add the subdir to kdebase, build it, the current splash theme is ported, "ksplashx Default --test" will show it. themes are not C++ code but are created using a simple syntax file, with slightly limited capabilities (see below); I could even add a script to convert KSplashML's Default engine-based themes if wanted. In practice, most of KSplashML's features shouldn't really matter and the only real difference should be almost instant startup. I don't really insist on dumping KSplashML if somebody sees a reason for it to live, but then I don't see it myself. No text support. Can be still done by preparing images with texts rendered into it. There's no i18n support either, but if needed, could be done by having extra images per language. However, splashes usually tend to display two things, 1) things like "KDE" or "3.5", which are not translated and are part of the images, 2) things like "Initializing peripherals" or "Loading the window manager", which are rather uninteresting and a lie anyway. Our startup sequence has changed quite a lot since the times this was done (and will most probably still change a bit for KDE4) and the messages no longer match, nor they make that much sense (I still remember the times when people complained about KWin starting way too long just because that message was shown while something else was hogging the system). I'd like to propose to just have, say, 8 or 10 checkpoints at some arbitrary points in the startup and just show progressbars or only icons or whatever depending on the theme for them (not necessarily always as much as 8 or 10). No support for locolor. KSplashML first tries a locolor version of the splash for bpp == 8. Do we still need that? Should be simple to add if needed. Obviously, since there's no C++ code, there's no way to add arbitrary things like icons jumping on the bottom edge of the screen, but do we really need that anyway? Here's the Strigi status. Strigi has moved into a more prominent location in KDE SVN: kdesupport/strigi. It will be a requirement for kdelibs soon and installation instructions are available on TechBase. This is a prelude to adding a new KFileMetaInfo implementation which relies on Strigi. The first implementation will pull data from the file itself. Later it will be extended to get information from Strigi's index and from NEPOMUK's 'triple' store. The GGZ Gaming Zone (or GGZ for short) is a cross-platform multiplayer environment focusing on casual online games, but providing development tools and infrastructure for other game types as well. Most of the client-side development focuses on Java, SDL/Pygame, Gtk+/GNOME and - now with renewed focus - KDE. By importing some of our KDE-specific libraries into KDE SVN and adding on top of them, we hope to get a more robust and pervasive gaming infrastructure for KDE 4.0. GGZ development for KDE is not new, those with a sense of real nostalgia will have heard of it already. What is new is the inclusion into KDE and the technical maturity of the framework. With just a few lines of code, game developers will be able to access great functionality such as game server events, chatting, statistics, savegames and tournaments. What still needs to be done at this point is a few common dialogs. The first game (KReversi) compiles nicely with GGZ support already, and playing in general works, but some protocol optimizations will follow. Future work includes improvements of the protocol code generator so that all hand-written network code can disappear and we can toggle between efficient binary communication and developer-friendly XML communication as we like. 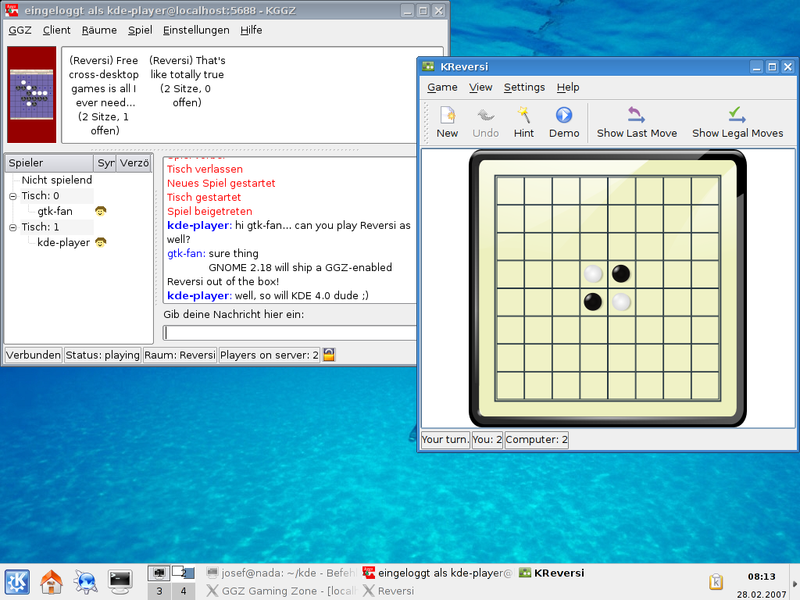 What is important to know (not comprehensible from the image) is that the "core client" to the left (the one players use to meet and chat) is still the old KDE 3 version and needs a rewrite, which might or might not happen in time for KDE 4.0. As an aside, Josef asks about the Commit-Digest extended statistics graphics, and if there is a way to contribute to the data collection effort. And i'm happy that he asked! KDE SVN account holders can add their data to the aggregated statistics by following the instructions at http://commit-digest.org/data/. Thanks! Fix crash when dropping a document template on an Untitled empty document by removing the hack to destroy/recreate the document if it is empty and Untitled. From my POV this case in handled, but if the Kate devels want, they can reopen the report. And following up the last commit, pressing ESC should hide and clear the field so I added a vanish() slot that does this. It could actually be useful to expose this slot via dbus as it's essentially a way to close the run dialog without killing the app. Use Extended mode instead of Multi for the file view, as it works better when doubleclick mode is used. Make sure the mode is set after changing view type. Thanks for the patch! memory leak; whenever init was called it was creating a new dptr without deleting the existing one, and setData called init. minicli would call setData repeatedly. unfortunately, setData was inlined and so were the constructors (!!). so if you encounter crashes in your apps (e.g. konqueror) after updating kdelibs, rebuild them. A disconnect was commented out and one was wrong, resulting in to multiple redraws of the message, when switching 10 times between two messages, you would actually start to notice the delay. Fixed that. Also fixed the ugly, ugly, ugly draw error on the first few messages!!! fix bug in engine, which caused gameovers pretty randomly. This means that the game is fully playable and releasable. We can now add as many dash lines as we want for a parallel or alternative combined fragment, by a right click on it and selecting 'Add Interaction Operand'. Implemented new application wizard plugin for KDevelop4. This appwizard understands the same template format I've used for KDE-Eclipse with an addition of 1 obligatory .kdevtemplate file. The new template format is dead simple: the project template is just an archive which will be unpacked as is to destination directory. No copy/process rules are required. File names and file contents will be processed by macro expander on unpacking. Added simple C++/Qt4/GUI application template for the new application wizard. Switched to new implementation of the text line. And finally fixed the dead keys problem. Undo/redo now works for simulation. Undo now support clean state. Spring graphics now looks quite better. Spring attaching with mouse now works reliable. Spring works even if one end is not attached. Added icons support to palette. Now it's time to actually draw them ! A new Action based approach to the learning menu. Currently none of the menu items do anything. Preliminary supports for text and choice form fields. Implemented a proof-of-concept KPart for raster images, using QGraphicsView. Adding support for creating and detecting a couple of the D-Bus standard errors. Implemented one of the most often requested features for Dolphin: allow that the command 'Delete' is shown in the context menu to bypass the trash. Like in Konqueror the default setting is that the 'Delete' command is not shown. TODO: currently this is a custom setting of Dolphin. Konqueror uses the global settings from KDE for this -> should this be changed to use the global setting instead? As Aaron suggested: use the global setting for "Show Delete command" instead of using a custom Dolphin setting. I hope I used the reworked KConfig classes in a correct manner (setGroup() has been marked as deprecated, Konqueror still uses those deprecated methods). Add suspend support using solid. Show a small arrow if a button has a popupmenu. Splash that's more capable than ksplashsimple and faster than ksplashml. First draft of the wireless network class, it only gets the properties at the moment. The icons view and details view don't use hardcoded (test-) values anymore, instead the settings for fonts, grid size, ... are read out. The settings dialogs itself will be reworked later if it is clear what should be configurable in which manner. Make 'Search History' menu item into a toggle which hides or shows the search bar when toggled. Search bar doesn't actually do anything yet. - Basic Coordinate Grid implementation. No optimizations for speed yet. - Rudimentary Wikipedia entry support for cities. initial implementation of CalculatorRunner plugin. Jippie: file previews are generated again! Thanks to Fredrik for giving me a hint how to do it (if I would have known that it is so easy, I'd have implemented it already some weeks ago...). It's very nice that the details view now also is able to show previews (Kudos to Interview Jippie: file previews are generated again! Thanks to Fredrik for giving me a hint how to do it (if I would have known that it is so easy, I'd have implemented it already some weeks ago...). It's very nice that the details view now also is able to show previews (Kudos to Interview & KDirModel). KDirModel). Support non-KSplashML engines in the kcm. Allow zooming in and zooming out in the icons view. * Revert the changes to the screen and emulation from the last commit. Will follow a different approach to allowing views to show different parts of the same session at once. * Make the "Search History" menu item a normal action rather than a toggle action. * Search terminal history and jump to first match when text in search box is changed. * Call QApplication::processEvents() periodically while searching history to prevent UI from becoming unresponsive with large histories. Icon in progress by Nuno Pinheiro. So Dolphin will provide a dock which contains the directory hierarchy, which will be synchronized with the active view. It does not clutter the UI (the dock can be turned off), but makes happy a lot of users -> kind of win-win-situation. show the options in an animated widget. tres cool. Finished feature where we make it possible to include a html part on every outgoing message which is based on the plain part, this means the receiver can see the colors of the quotation level and clickable links. Fixed libkmime for that and added the configuration option for that. In the past selecting mailboxes always resulted in populating the messagelist. Last mentioned cleared the headers. Now that is no longer the case, so clear the header list as soon as someone clicks on another mailbox. Much cleaner and should have been done from the start. Provide a Play button in the sound file dialogue. c) go to next folder with unread messages && go to b.
o Started to implement saving in kopageapp so that I have one application to test the saving/loading stuff. The code is still in the designing phase, so please wait until the api has setteled before using the code. initial patch to be able to run Krita scripts from within the commandline. First (simple) version of connections between shapes. This is just playing around, not much in API stability yet. This requires the phonon engine, and xcb. The video currently only displays in a very small part of the widget, thats next on my list of things to fix. The Statusbar now Belongs to the playlistwindow. This makes things look a good bit cleaner, but still needs the position slider to make it up to the toolbar. I think that we should still have a statusbar for Messages and stuff for the entire App, though maybe we can work around that somehow? Additionally, the playlist search field now is a lot more reasonably sized, making things look a good bit nicer. Up next is beautification. As discussed, make the first star tri-state: clicking on it now toggles between half-star, full-star, and no rating. move repeat/random to the playlist instead of the statusbar. I'm experimenting with leaving them as text.. I always found the icons hard to follow. This also spaces the playlist a bit better in my opinion, we can talk about it. Finish colored rating stars. Can specify all colors, they are saved, and can decide whether to have a separate half-star color or whether they should follow the normal star color. Colors are updated instantly everywhere they're used. Try it out! Another patch by Fela Winkelmolen. GUI: The "General" page of the configuration dialog has been changed. Instead of LCD numbers, there are now spin boxes. There are also some behind-the-scenes modifications to the layout system to make it easier to add/remove config elements at a later date, but it doesn't change the view at all. I'm working on making the same changes to the "Game" page, but it's a bit more complicated than the "General" page. 800ms is used to parse the headers for essential data (messageid, reply to data and date). I would love to know how to make that faster. -Fix searchline not working when switching mailboxes. Make use of the new computeInverseSafely() method introduced in Eigen 1.0.5. This is much faster for small matrices (up to size 3x3) because then it doesn't compute a LU decomposition. It also makes simpler code in KSpread. Make Kopete::Message::unescape a whopping 4 times as fast by eliminating QRegExp. Of the remaining cycles, about 2/3rd goes to QString::fromLatin1() and ~QString(), but that can't be optimized in KDE 3.5. (Moving it out of the loop had actually a negative effect because not all strings are created as much.) When porting to KDE 4, consider static QLatinStrings to avoid the creation of those objects altogether. Patch from Scott Wolchok, which significantly increases speed of conversion in the ipfilter plugin. * Begin port of widgets. The curve appearance widget is now a Qt4 widget with a designer2 plugin. * Large part of the port of widgets is done. I still have some more to go, but this eliminates a lot of old cruft and gets the designer files working with Qt4. Remove frame around various Konqueror file views, although it seems likely that some of these widgets will be replaced in future anyway. if QtScript is detected, we assume that QtUiTools needs to link to it. But this does not work. For whatever reason, the last block simply doesn't work: SET(QT_QTUITOOLS_LIBRARY ...) and nothing is exactly the same. I don't have time to investigate why SET doesn't set. If you're building KDE with Qt 4.3, for the moment you have to set QT_QTUITOOLS_LIBRARY manually to "-lQtUiTools -lQtScript". Added branch of plasma to test whether QGraphicsView is sufficient for our purposes. Move Strigi to a more prominent position in svn. Fix compilation of kfile. Now we have a relatively small program to start testing. Script for converting from KSplashML themes using Default engine. Enable compilation of Solid's NetworkManager backend. At the moment it is view/discovery only. Network control will be added after validating the existing API. Move the InputBox from SuperKaramba to Plasma. omg this is ugly. but at least the text lines up properly now. at least until the next time tt changes their mind as how to lay out the text inside a line edit =/ why aren't the default style option settings available in the public API?! plasma will now use the kdelibs coding style. as much as it pains me, this is the more rational choice if only to keep it consistent with libs and between krunner and plasma. particularly as people are switching back and forth between developing the latter two. Relicense from GPL to LGPL so it can move to pimlibs later on. Permission from all eleven authors has been received. Changed the way we are dealing with the namespaces. Modules (aka scripts) are now always running within there own ns + we provide a bridge with __main__. Improve the way KSpread uses Eigen to invert matrices. Now requires Eigen >= 1.0.4 or latest svn, so update CMakeLists also. I couldn't figure how to run unit-tests, README says I should run ctest but it complained it couldn't find any test. Just like in normal flake; make sure that a set of repaints are queued and only paint when the next event comes around. Note that the actual painting has to be in the Gui thread to avoid multithreading problems in all shape-pugins. I hope that the actual layer->setDirty can then be done multiThreading to avoid waiting too long before we actually update the GUI. Refactor KoCanvasController to use QAbstractScrollArea and port Krita to the new situation. This will break every other KoCanvasBase implementation. Please look at <a href="http://wiki.koffice.org/index.php?title=Flake/Canvas">http://wiki.koffice.org/index.php?title=Flake/Canvas</a>; for the rationale behind this move and for porting tips. Krita's qpainter canvas hasn't yet received the optimizations this move makes possible, but those are easy now. Also: a unittest for KoZoomHandler. Expirement with the idea of a global search widget. I'm not quite sure how I like this idea, it currently isn't connected to anything but the playlist; I think it might be cool if we had one widget filter the playlist and the collection or whatever tab may be open. Also delete amarokui_xmms.rc as it seems to be really ancient and unnecessary. Merge the uirefactor branch back to trunk. This branch explores the concept of a three panel layout, a panel dedicated to finding music--a panel dedicated to managing music--and a panel dedicated to viewing information about ones music. This layout is designed on a mockup done by Max Howell. Enhancements: Amarok is now a "proper" main window. This should allow for easier ui redesign in the future if it should become necessary. The context browser has become a central widget that is much more central to the playback experience. This enhances the important of the context browser, or context pane as it is now called. REGRESSIONS: * Browsers cannot be hidden properly. Because we now have to add widgets to a QDockWidget before adding them to the ui, when the widget is hidden the dock widget remains--this needs attention. * The statusbar looks extremely crowded. The information needs to be broken up, with the song progress bar making it into the top toolbar and the progress dialog being moved to the browsers pane. * The playlist also looks very crowded. This should be fixed as the playlist gets refactored to fit the new UI. This commit also includes a few other nonrelated changes--Using Qt::escape() instead of our own escapeHTML; cleaning up some header files, and experimental support for video playback (disabled). renaming action. need to do some heavy q/a on this. * Started to think about an automated solution to handle enabling / disabling of variants at compile time. Something in the build process should create a file like variants-autogen, which is later included in variants.cpp. * Disabled all variants except chess. Let's fix things for chess until it gets stable, then let's fix all other variants one at a time. * Restored che knight rotation. GUI: complicate the interface a bit, new button to import a script into 1 of 3 locations and a checkbox to enable/disable non-script entries. Neither are hooked up yet. as more work needs to do be done in loading all entries and separating the various locations into what they can contain. Desktop and/or Script should import copy or link? perhaps a dialog option? File input, destination combo and link checkbox?